2 Piece mound with turf, skid-proof. Pitchers can train year round with this 2-Piece mound. Constructed of high density foam and protected for durability with Rubber Armor Technology. 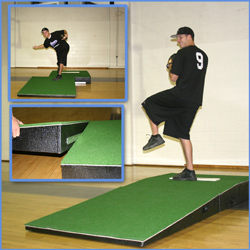 Skid proof mound that won't damage any gym floor.